My attitude towards extreme mountain climbing varies between amazement and admiration for something like Touching the Void, to disdain and disgust at self-important trust fund kids who pollute places like Mt. Everest with their corpses and oxygen bottles. The shark fin of Mt. 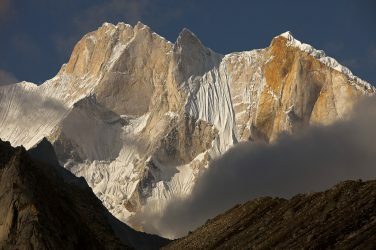 Meru in the Indian Himalayas has been characterized as the anti-Everest. More than 4,000 people have conquered the summit of Mt. Everest since Sir Hillary first did it in 1953. Only 3 men have summited Meru, and this was in 2011. No one has done it since. In a comment on my review of Everest one of our Ruthless viewers suggested that I check out the documentary Meru. I finally did and it was amazing. At Meru, you are totally dependent on yourself and your climbing partners. There aren’t staggered base camps, nor Sherpas to mule up equipment and to establish and tie off your lines. There is no oxygen, no nothing. The climbers have to carry up over 200 lbs. of supplies on their backs, and without a base commissary to replenish food or other luxuries. Neither are there established routes or ladders over crevasses. Meru is only for the Superstars of climbers to try, and most of them have failed. 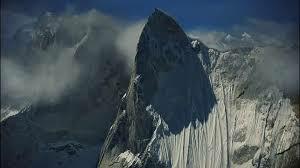 The Shark’s Fin is a 90 degree sheer face of cold and unforgiving granite that punctures the sky at 20,000 feet. It is no-man’s land. Meru is the most unique documentary on mountain climbing I have ever seen. 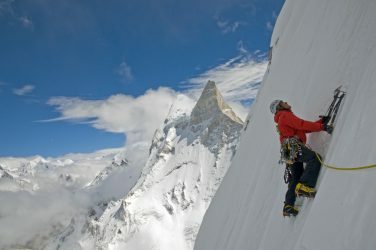 Not only did the climbers have the almost impossible burden of conquering the toughest climb on earth, but Jimmy Chin also did all the filming of the climb. There were no war correspondents, film crews or anything else on the Sharks Fin. The documentary was presented in 3 parts. 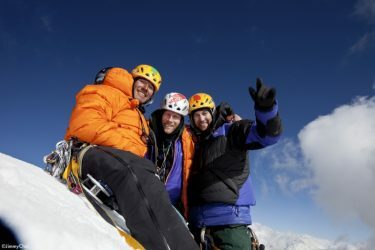 The first part chronicled the first attempt made by Conrad Anker, Jimmy Chin and Renan Ozturk in 2008. They made it excruciatingly close to the top, but had to turn back because they had run out of food because of a freak storm that left them pinned to the mountain for 4 days. The second act in the film gave us a lot of the backstory of the climbers and included graphic footage of a devastating injury to Renan Ozturk as he was doing a snowboarding documentary with Chin at Jackson’s Hole. Due to a horrific head injury, medical professionals were pessimistic about him ever walking again, much less climbing mountains. 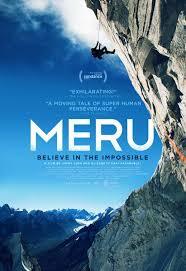 The third part of the documentary was the actual attempt on Meru in 2011. Meru has the most gorgeous mountain cinematography you will ever see. When asked why he risked his life trying to climb Meru, Chin calmly replied “For the view”. I’ve watched dozens of mountain climbing films and documentaries and Meru’s breathtaking shots make all the rest look like Kansas. I read many comments where people were disappointed in the brevity of the filmed portion of the final ascent, but again there were no film crews along to capture this epic event. That we have any meaningful documentation of this unique accomplishment is treasured. This is were quality clearly trumps quantity and what we do get to see and share is 3 humans conquering a mountain that no one thought could be conquered. It took the climbers 11 days to make the ascent and 3 days to make it back down. Unfortunately, there is no footage of the descent and probably for good reason. On most mountain endeavors, the climb down is more dangerous than the ascent, and the only evidence of their accomplishment was dependent on their very survival. On Meru, you are truly alone. 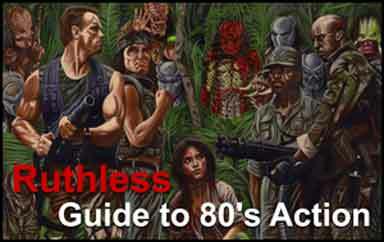 Also, this trio didn’t even know at the time that they were going to create a documentary film. I’m glad they did. Meru is highly recommended. Meru is available to be streamed from amazon, but only available on disc from Netflix.You can also add this true story of three climbers to your collection with amazing discounts through retailers like DVD Planet.